After knowing that the oil level of my skin was rated low, I decided to switch back to Etude House AC Clinic skin care line. I guess you guys know that the Innisfree Jeju Volcanic skin care line targets sebum and pore issues. Currently, some parts of my skin don't have much oil to strip anymore so I thought it would be best to quit using this skin care product line. Anyway, I had gave the cleanser and lotion to my brother who has extremely oily skin and he's loving it! However, I'm still keeping the essence cause I plan to resume using it on my oily T-zone in the future. As for the toner, I find it's not too strong hence, I'm still using it in my current skin care routine. Since I have mentioned in my blog and enquiry emails that acne products usually may cause the skin to feel dry, some of you might be curious on why I chose to resume using acne care products (Etude House AC Clinic) when my skin already felt dry. Well, I shall clarify... although acne care products usually may cause skin to feel dry, the Etude House AC Clinic works really well for my skin. It does not overly strip my skin's oil, causing further drying issues. Aside from that, I have slight breakouts on my right cheek and chin; and furthermore, I kept a spare set of Etude House AC Clinic. For that reasons, I decided to just stick to it for the moment. Basically, I have only changed the basic skin care products while the rest of the products remain the same as previous routine. So... at the end of the day, I still switched back to Etude House AC Clinic...hmmm... lol... Alright, I shall end off with my thoughts on the Innisfree Jeju Volcanic skin care line~ — Innisfree Jeju Volcanic skin care line is really effective in oil controlling and pore cleansing. It's a perfect skin care line for oily skin and summer season, but not for dry skin and cold winter season in my opinion. 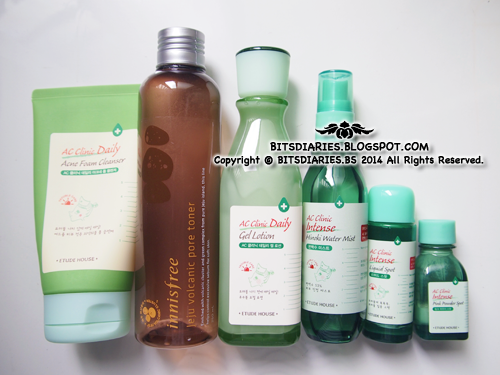 P.S: For a more detailed review on each product from the Innisfree Jeju Volcanic skin care line, you can find the *link in the Day and Night routine section.